All Cold Subs Served with mayonnaise or mustard, lettuce, tomatoes, onions, banana pepper, oil, vinegar, salt & pepper. All combos come with French fries or chips & fountain drink. American, swiss & provolone cheese. Ham, salami, capocolla, pepperoni & provolone cheese. Served w/ mayonnaise, lettuce, tomato, onion, oil & vinegar. Served w/ spicy mustard, lettuce, tomato, banana peppers, oil & vinegar. Served w/ marinara sauce & parmigiana cheese. Served w/ sautéed onions, bell pepper, marinara sauce & parmigiana cheese. Your choice of (sautéed onions, bell peppers, mushroom) mayonnaise, lettuce, tomato, oil & vinegar. Served w/ mayonnaise, lettuce, tomato, onion, sweet peppers, oil & vinegar. Served w/ provolone cheese, marinara sauce & parmigiana cheese. Grilled chicken toped with ham, swiss cheese, mayonnaise, lettuce, tomato, onion, oil & vinegar. Served w/ mayonnaise, lettuce, tomato, onion, black olives, oil & vinegar. Served w/ sautéed onions, bell peppers, mushroom, mayonnaise, lettuce, tomato, oil & vinegar. Served w/ tare sauce, lettuce, tomato, onion & vinegar. Served w/ mayonnaise, lettuce, tomato, oil & vinegar. Grilled pepperoni with provolone cheese, marinara sauce & parmigiana cheese. Fried egg plant with provolone cheese, marinara sauce & parmigiana cheese. Grilled chicken with provolone cheese, buffalo sauce & ranch OR blue cheese. romaine lettuce, tomato, cucumber, onion, black olives, green olives, feta cheese, oil, vinegar, salt & pepper. Comes w/ GREEK SALAD, rice, pita bread & tzatziki sauce. Comes w/ greek salad, grape leaves, pita bread & tahini sauce. Comes w/ Spanakopita, GREEK SALAD, grape leaves & tzatziki sauce. Grilled chicken, hummus, tomato, cucumbers, pita bread & tzatziki sauce. Gyro over hummus, tomato, cucumbers, pita bread & tzatziki sauce. Hummus, tabouli, grape leaves, pita bread & tzatziki sauce. Eggplant w/ ground beef, bechamel sauce & pita bread. All combos come with: French fries or chips & fountain drink. Comes w/ tzatziki sauce, feta cheese, lettuce, tomato & onion. Comes w/ sautéed onions, green peppers, pickles, tzatziki sauce, feta cheese, lettuce & tomato. Comes w/ tahini sauce, feta cheese, lettuce, tomato & onion. American, feta cheese, tzatziki sauce, lettuce, tomato & onion. Comes w/ tzatziki sauce, feta cheese, lettuce, tomato, onion. All Above served with marinara sauce, parmigiana cheese & garlic bread. All Salad garnished with romaine lettuce, tomato, cucumbers, onions, banana peppers, egg, oil, vinegar, salt & pepper. Ham, turkey, American & provolone cheese. Ham, salami, peperoni, capocolla & provolone cheese. All above toppings plus black olives, green olives & feta cheese. Your choice of sautéed onions, green peppers, mushroom. All burgers come with french fries and fountain drink. Served with mayonnaise, mustard, lettuce, tomatoes, onions & pickles. All cheesecakes is cheesecake factory. 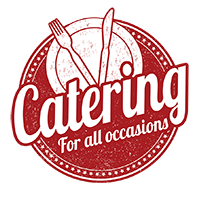 Whether you are celebrating a birthday party, office party, gathering for the big game or bringing everyone together for a special occasion, we’ve got you covered. Just give us a call and let us work out the perfect party package for you. Homemade tzatziki sauce & pita. Stuffed grabe leaves & tzatziki sauce. Falafel with tahini dressing & fried pita. Marinated in plain yogurt, saffron, juice of onions, lemon juice, olive oil and spices served over rice and Greek salad. Chopped lamb & beef gyro served over rice & Greek salad. Grilled chicken breast marinated in Italian marinara sauce served Over a bed of hummus topped with sliced tomatoes, olive oil & parsley. Fresh ground beef minced with onions and parsley topped with sliced tomatoes baked in a tomato sauce (or without tomato sauce) and middle eastern spices. Chickpeas combined with green onions, parsley, cilantro, deep-fried & served with greek salad, pita bread & tahini sauce. Comes with a bed of hummus with fresh tubali topped with stuffed grape leaves, served with pita bread & tzatziki sauce. Grilled red, yellow, green peppers, Red onions, squash & zucchini in a garlic olive oil dressing, served with pita bread & tzatziki sauce. Topped with mozzarella cheese and marinara sauce served over Spaghetti with garlic bread steaks. ITALIAN WITH PROVOLONE CHEESE . TURKEY CLUB WITH SWISS CHEESE. HAM, TURKEY WITH PROVOLONE CHEESE. TURKEY, ROAST BEEF WITH SWISS. OUR HOME MADE TUNA SALAD OR CHICKEN SALAD SUBS. Served with your choice of sauteed onions, green peppers, mushrooms with provolone cheese. lettuce, tomato, onions, banana peppers. Mayonnaise, mustard, oil & vinegar on the side. Bed of fresh romaine lettuce topped with tomatoes, cucumbers, red onions & sweet peppers served with your choice of homemade ranch or balsamic vinaigrette. Bed of fresh romaine lettuce topped with tomatoes, cucumbers, red onions, Kalamata olives, crumbled feta cheese & olive oil served with greek dressing. Garden salad topped with marinated grilled chicken Served with your choice of dressing. Our famous Greek salad topped with marinated grilled chicken salad. Garden salad topped with turkey breast, ham & American cheese served with your choice of dressing. FOR DELIVERY ORDER MINIMUM OF $200.00, DELIVERY FEE $20.00 WITHIN 10 MILES.